Click below to utilize our easy shopping through Amazon where a percentage of the donations will go back to the ministry. 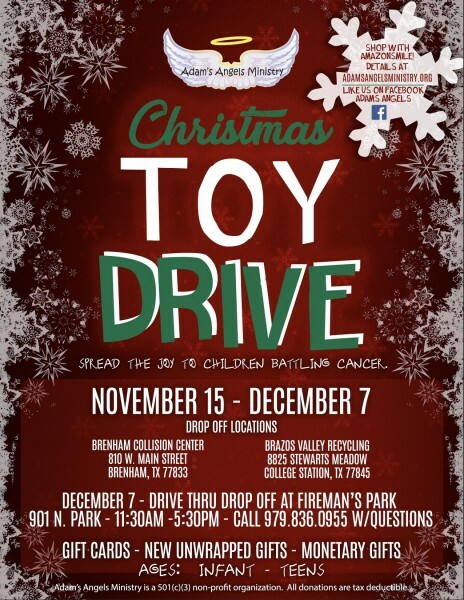 Toys will be shipped directly to Adam's Angels Ministry. FOR COMPLETE INSTRUCTIONS / GUIDELINES FOR OUR NEW & IMPROVED ON-LINE SHOPPING GO TO THE "Fundraisers & Events" TAB, THEN "Annual Toy / Gift Drive". What is new and improved and why the change? AmazonSmile is a website operated by Amazon with the same products, prices, and shopping features as Amazon.com. The difference is that when you shop on AmazonSmile, the AmazonSmile Foundation will donate 0.5% of the purchase price of eligible products to the charitable organization of your choice. You will see eligible products marked "Eligible for AmazonSmile donation" on their product detail pages on smile.amazon.com. On your first visit to AmazonSmile smile.amazon.com, you need to select a charitable organization to receive donations from eligible purchases before you begin shopping. Amazon remembers your selection, and then every eligible purchase you make at smile.amazon.com will result in a donation. How do I find the Adam’s Angels Ministry wish list?